Don’t let electrical wiring problems catch you in the dark—look for these 10 signs of bad wiring & seek professional help. When dealing with wiring for residential electric, Anderson homeowners need to take heed—never tamper with the wiring in your home. Only a licensed professional should do the work. When it’s working, the wiring in your home is invisible. But when wiring starts to go bad, problems can go unseen. To the untrained eye, good wiring often looks the same as bad wiring. But according to the U. S. Fire Administration, bad wiring causes more than $800 million in damages, more than 67,000 fires, and hundreds of deaths each year. One problem is that many myths surround electrical wiring, and most homeowners are not qualified to fix their own electrical wiring problems. Yet try they will—the Do It Yourself industry is thriving. And while many homeowners can afford to try to fix a plumbing problem or put up drywall, they simply cannot afford to fix an electrical wiring problem, no matter how minor it may seem. Most modern homes are built with modern circuit breakers that have replaced the old-fashioned fuse box. It’s common for a circuit breaker to trip and turn off a circuit automatically. When this happens, you merely have to put the switch back. But if a circuit breaker trips frequently, you may be overloading and exceeding its safety capacity. It could also be a sign of a short somewhere in your wiring. Unrepaired, this problem could lead to a dangerous fire. Frequently flickering or dimming lights are a common problem in older homes, especially those equipped with modern appliances such as microwave ovens and desktop computers. Sometimes a flickering lamp itself is the problem—you should test the lamp or fixture in question in an outlet far from its normal one. But if more than one light or fixture flickers regularly, you could have a serious wiring problem. 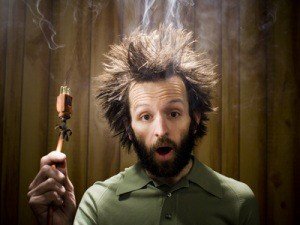 Consult a qualified electrician to determine if your household electrical system needs an upgrade. In the vast majority of cases, a modern circuit breaker is designed to hold a 15-amp breaker for maximum protection in most rooms. However, many homeowners replace those original 15-amp breakers with 20-amp breakers. This can be a fatal mistake because 20-amp breakers are meant for major appliances, not everyday use. Putting on the wrong breaker allows overloads to occur without tripping the breaker, increasing the risk of serious overheating and possibly a fire. Modern electrical appliances and light fixtures are designed to work without a hint that they need electricity to work. If your lamp buzzes when you turn it on, it could be because of a bad lamp or a bad wire. If you feel a slight shock, vibration, or buzz when you turn on an appliance, it could have a serious electrical problem. If a light fixture or appliance buzzes or shocks in another outlet, you need to have an electrician check out the wiring in your house. Electrical outlets should never be hot to the touch, never buzz, and never have char marks. These are warning signs of bad wiring inside or near the outlet. Another sign of bad wiring is a dead outlet. This problem could be caused by a loose wire or a faulty do-it-yourself job. Always have a licensed electrician perform even minor electrical repairs. Since electricity was first included in home construction, building codes have required that all home and commercial wiring must be done by a qualified and licensed electrician. When your home was built, all of the electrical outlets had to be grounded according to code. But over time, those ground wires can come loose. Or if one outlet is ungrounded for repairs, other outlets in the system become ungrounded as well. Ground fault circuit interrupters (GFCIs) are required by code anywhere an electrical current comes in contact with the ground or is placed near running water. These devices save lives by preventing the potential for deadly shocks. Modern GFCIs have built-in testers and should be tested regularly. If one of yours is not working properly, it could be the result of a faulty GFCI. But more seriously, it could be the result of faulty wiring. Faulty cable splices, damaged or frayed wires, or cut insulation can be an extreme fire hazard and are often a sign of an amateur electrical job. A problem like this one often goes unnoticed. If any wiring work was ever done in your home by an unlicensed electrician, you should have that work reviewed and corrected by a properly certified professional. Once popular in the 1960s and 1970s, aluminum wiring can be a major problem. Unlike traditional and more-effective copper wiring, aluminum wiring expands and contracts as the seasonal temperature changes, leading to loose connections and a major fire hazard. If your home has aluminum wiring, consider replacing it. If that job is too costly, at least have all the connections pigtailed with copper wiring. The odor of burning plastic or vinyl is unmistakable. But in the case of wiring, it may be hard to locate and identify. But if you smell something electrical burning, consider yourself lucky—most warning signs of electrical fires are invisible, colorless, and odorless. Electrical wiring can heat up and “burn” for years before it becomes superheated and ignited nearby materials. If you’ve noticed any of these electric wiring problems in your home and need help correcting them, just give us a call . We specialize in residential electric in Anderson SC and would love to help! An electrical boat dock in Anderson SC will provide you with convenient and safe access to your boat. When you are designing your boat dock with a company offering residential electrical services, you should be sure to install lighting that provides you with proper visibility. When you are docking your boat at night or in harsh weather conditions, your dock lights will allow you to safely maneuver your vessel. A company offering residential electrical services and lighting near Anderson SC can help you design the perfect lighting configuration for your dock. To assist you with your project, here is a look at some common boat dock lighting mistakes that should be avoided. When you are installing boat dock lighting, it is important to avoid installing lights that are tall and very bright. If your lighting is installed too high off of the level of the dock, your visibility may be compromised. Instead, it is a great idea to install smaller lights that are at the hip level of the average person. This lighting level will provide you with proper visibility when you are getting off of your boat. Another boat dock lighting mistake to avoid is using lights that are housed in metal casing. Since metal reacts and corrodes when it comes into contact with water, metal lights will quickly deteriorate when they are installed on your boat dock. To ensure that your boat dock lights last for as long as possible, you can choose lights that are housed in waterproof plastic. As you are designing your boat dock lighting, you may pay specific attention to the area where passengers will disembark from the vessel. However, it is also highly important to illuminate the end of your dock. To ensure that you are able to identify your dock when you are pulling in during the nighttime, you can incorporate one or more colored lights into your design. Many people enjoy doing their own work on their homes. If they have the skills and tools, the DIY project can be very rewarding. It’s a great way to save money and feels good to have done it yourself. Some may think electrical work can be done just as easy as other home improvement projects. However, you should think twice when working on items electrical related. The hazards can be lethal and catastrophic. Fire: Every year hundreds of electrical fires are caused by improper connections and unstable wiring systems. Licensed electricians are well versed with a code book they follow published and updated every three years by the National Fire Protection Agency. Bodily Injury or Fatalities: The truth. Not a scare tactic! Electricity is not only dangerous to work with, it can also cause serious injury or safety hazards to persons or property if a job isn’t performed correctly. Experienced electricians spend thousands of hours learning and implementing the safety aspects when dealing with electricity. Property Damage: Frying or melting the wires of the appliance or equipment, or worse–the wiring inside the walls. In some states, insurance companies will not pay for any damages if electrical work is not done by a professional, licensed and insured electrician. Who wants that hassle and grief? Many people desire to save money and have the satisfaction of “doing it yourself”, but doing DYI electrical can cost you more in the long run. Even what may look simple can be done incorrectly if you don’t know exactly what you are doing. What looks to be an easy do it yourself project can turn into a nightmare due to inexperience. Have questions about your next project? Need advice about the electrical problem you are thinking of doing yourself? Contact Isom Electric. The combination of shorts in electrical lights and a tinder-dry tree can be deadly.There are 250 Christmas tree fires and 14 related deaths each year, according to the U.S. Fire Administration. So keep your tree well-watered. Not only will it stay fresh and green, but it might also keep your house from burning down. Water and debris can get into outdoor sockets, so make sure outdoor lights are plugged into a ground fault circuit interrupter outlet to reduce the risk of shorts and shocks. When running extension cords along the ground, make sure to elevate plugs and connectors with a brick to keep snow, water and debris out of the connections. Also, tape down any ground-level extensions cords to prevent people from tripping over them. When you put your lights back into storage after the holidays, make sure to put them in a well-sealed container to prevent possible water damage and to block hungry rodents looking to turn the cords into lunch. Adam Verwymeren is a Networx – http://www.networx.com – writer. Do you have an electrical repair or a project you’re moving forward on, or you want to improve the look of your home or business? Will you do it yourself, hire a handyman, or hire a qualified electrician? Many people are looking for ways to cut costs when it comes to electrical repairs or additions. One way people have found is through their own attempts or hire someone that claims to be a qualified electrician doing work as a “handyman”. While many handymen are capable of doing the electrical work you need, how are you to know if they are able to do it correctly? Most work performed during a project is hidden by walls, junction boxes, or a location that has limited access. There is potential for huge liability if certain codes are not met. Electrical work is very dangerous. A handyman may have some electrical experience, but they are not legally licensed as an electrical contractor. You take a huge risk when you hire someone that is not licensed just to save a little money. If the work does not get done correctly, you could be stuck and end up paying more in the end. It is important that you make an effort to find a professional electrician that can meet the requirements for your project. Call Isom Electric to discuss your project and how we can help you get it right the first time. If you have surveillance, it is a very good idea to make certain that the areas being monitored are well-lit. A poorly lit area will produce poor surveillance footage and not be helpful when needed. There are many systems available that are easy to install yourself, but having professionally installed security lighting can make the difference that you need to be better protected. A professionally installed lighting system will be installed with higher quality equipment and ensure that it is installed properly and connected reliably. It is important to keep these areas illuminated at night either with motion activated lights or permanent night time lighting. Putting these measures in place will go a long way toward improving the safety and security of your home. Security lighting can light help you avoid trips and falls and make it easier to find the keyhole when opening your front door. Contact Isom Elecitrc for top-of-the-line exterior lighting systems. We look forward to handling all your lighting needs. A general rule of thumb to remember is that water and electricity do not mix well. The danger of this combination can actually be fatal. Most of these tips come from this basic but important rule. • Move electrical toys and appliances away from pools, bathtubs, sprinkler systems, sinks, etc. • Electricity travels very quickly through water and leads to electrocution! Do not touch an electrical toy or appliance if you are wet or standing in the water. • Be certain that all of your major appliances are not plugged into extension cords. Washers, dryers, and refrigerators should always be plugged into grounded outlets. • Consider upgrading to GFCI receptacles in all bathrooms, kitchens, garages, basements, and pool rooms if you have standard receptacles in these rooms that may see water or moisture. • Be aware of where your circuit breakers are and how to turn them off safely in the event of an emergency. • Do not ever plug in an appliance with a cord that shows any signs of damage. If you have any questions about our summer electrical safety tips or need electrical updates, rewiring, and remodeling to your home, call Isom Electric at 864-226-2433 today! Memorial Day is right around the corner. For many of us, this will be the beginning of many weekends spent barbecuing, swimming, home maintenance, landscaping and other outdoor projects. Whether you’re going for a swim or planting flowers, it’s important to remember that you are surrounded by electricity and that outdoor electrical safety shouldn’t be overlooked. Consider these electrical safety precautions when you’re out in the back yard. Inspections: Before the warm weather arrives, have an electrician inspect the pool, spa, or hot tub. Follow up with any necessary upgrades or repairs. Battery-operated devices: Having electronics around the pool can be dangerous. Use battery-operated devices around water instead of cord-connected devices. Weather ready: Do not swim or hang out near the water before, during, or after a thunderstorm. Water and lightning are a dangerous combination. Outlets: Check that each outlet has its own weatherproof outlet cover and keep it closed when not in use. Electric gardening tools: Avoid using corded power tools in wet or damp locations. Check all tools for cord damage, such as cracks or exposed wires, and make sure they are in good condition and operating properly. Extension cords: Use only extension cords that are rated for outdoor use. Good electrical safety habits can help you make sure your family, friends, and neighbors are safe and free to enjoy a little outdoor time in your back yard this season. What a summer we are having so far! The southeast has been soaked with rain and hit pretty hard with some severe weather. And now with hurricane season just around the corner, we can expect some more to come our way. With the threat of severe weather, it is always nice to have the modern convenience of electricity with an automatic enclosed home generator. But for some electricity may be a more immediate concern. For example, when your home loses power, refrigerators, HVAC, and medical equipment stops working. If the power outage lasts a long period of time, a home may become uncomfortable or uninhabitable due to temperature. In winter, it can lead to water pipes bursting and freezing temperatures inside. In the summer, it can lead to heat stroke or even death. Generators for businesses can keep revenue coming in when power is out. For hospitals, it can mean life or death to some patients. For industrial complexes, it can keep things running until you can go through the proper shut down procedures thus protecting your machinery. No matter your needs, Isom Electric can help you choose an emergency power generator to meet your needs. Whether you are looking for an automatic enclosed generator for your home, a portable generator for recreation, or a commercial generator for industrial or health care applications, Isom Electric is here for you and the things that matter most to you. With spring headed our way, it’s time to start thinking about your boating activities and boat dock lighting. Lighting your boat dock is important for the safety of you and your passengers when entering and exiting your boat in the dark. Dock wiring and lighting from Isom Electric creates a safer environment on your dock. It can also be a wonderful feature to have if you want to entertain on your boat dock after the sun has set this summer. It can also help protect your investment. Lighting your boat dock properly can help ensure that you can see the dock well when returning from a voyage. Also, a dock that is not lit properly can lead to boating accidents that cause damage to the boat or the dock. 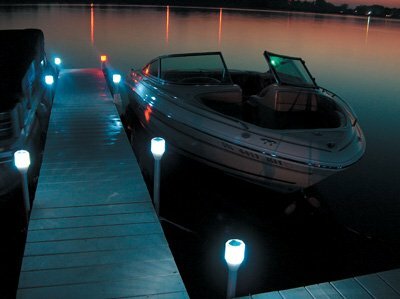 Boat dock lights can make your boat dock not only a safer but also a much more enjoyable place. We use all ground fault circuits. We can provide the proper installation of all wiring, grounding, and bonding of any motors or pumps located on your dock. We can even inspect your dock to make sure it is safe for your up-coming spring and summer fun on the lake! Unexpected power outages are a part of life. Emergency power systems can lessen the risk and provide a reliable source of power to meet your needs. We have put together some of the more popular misconception and truths about standby generators and portable generators. Misconception: All generators are the same. Truth: The automatic home standby generator is a powerful, fully automatic enclosed generator is the most appropriate generator for residential use. They are quiet, reliable and loaded with special features. They can be solar-operated or gas operated. The portable generator is an affordable solution for recreation applications, job sites and emergency backup power. Commercial generators utilize industrial grade engines for dependable service. They provide peace of mind for health care facilities as well as industries. Misconception: You have to go outside to start your standby generator. Truth: Standby generators are fully automatic and go on seconds after utility power goes out. When power is restored, the standby generator powers off automatically. Misconception: Portable generators can be operated anywhere. Truth: Portable generators need to have good ventilation. They create the deadly gas, carbon monoxide, and need to be operated outdoors away from doors, windows, etc. Isom Electric can help you choose an emergency power generator to meet your needs. Call us today and let us help you to protect the things that mean the most to you. We recommend Milbank generators for your peace of mind.